***The visual arts “Conceptual Qualities” criterion does not necessarily mean Conceptual Art, and Conceptual Art does not necessarily mean Found Objects. In the recent examination session a number of students went down a strongly ‘conceptual’ route and having chosen that route then went down the avenue marked ‘Found Objects’. “Conceptual art can be – and can look like – almost anything. This is because, unlike a painter or sculptor who will think about how best they can express their idea using paint or sculptural materials and techniques, a conceptual artist uses whatever materials and whatever form is most appropriate to putting their idea across – this could be anything from a performance to a written description. Although there is no one style or form used by conceptual artists, from the late 1960s certain trends emerged. Browse the slideshow below and read the captions to see examples of conceptual art and to find out about some of the main ways conceptual artists explored and expressed their ideas”. Those concerns and issues are as relevant now – after the first examination of the new course – as they were then – for the last examination of the ’old’ course. 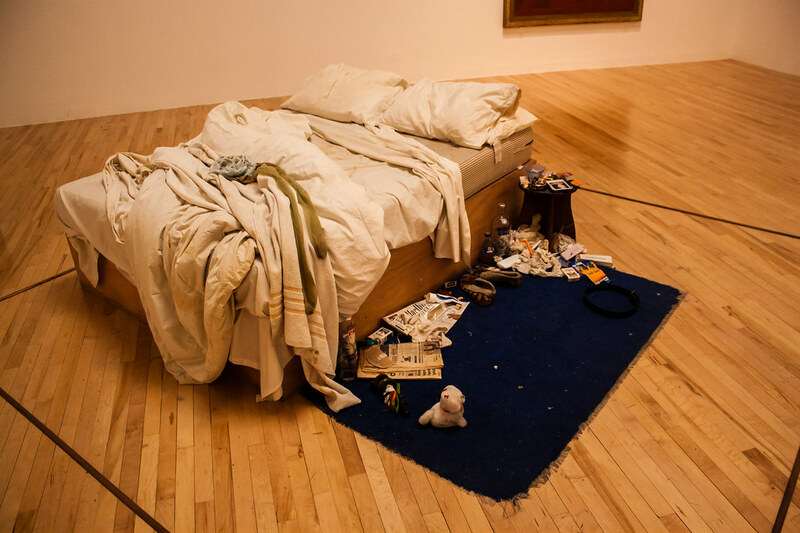 It’s 99 years since Duchamp’s ‘Fountain’ (1917) and 17 years since Tracey Emin’s “My Bed” – both of these in the context of their time were of course ‘contemporary’ – but were also provocative, creative and imaginative. To do well in terms of concept moderators are expecting to see some degree of sophistication, as opposed to “imagery, signs and/or symbols that are obvious, contrived or superficial”. Ideally, the work should show evidence of a thoughtful and considered approach with subtle and/or complex ideas and imagery. For example, a photograph of a bag of rubbish. This was supposed to express ideas about waste, the things we are doing to the environment and global pollution. A student exploring the theme of teenage pressure and anorexia presents a plate full of artificial sweeteners – because that is a ‘conceptual art’ expression of anorexia. A collection of bottles means alcohol abuse. A glass of water means the world’s resources are running out (and/or global warming). None of these show evidence of a thoughtful and considered approach. All are predictable and show minimal elaboration of ideas, concepts etc and/or minimal use of imagery. Of course, the mark is holistic and so a few weak ideas do not mean that the whole exhibition is weak – but in terms of “Conceptual Qualities” these artworks do seem to fit in the 1 – 3 level descriptor. If you are going down the conceptual route please try to avoid the obvious, predictable, easy and/or lazy options. These may be examples of conceptual art – but they are not particularly good, thoughtful or imaginative. Also, remember that in most cases the examiner will not see your Process Portfolio. So if you are including some form of conceptual art in your exhibition, in addition to using the curatorial rationale to explain the selection, arrangement and relationship between your artworks and the viewer within your space, provide the moderator with some evidence of your intentions and knowledge/understanding of conceptual art.